I finished these just in time to wear on Easter Sunday. I call them my Easter socks because the colors remind me of pink & yellow Peeps. 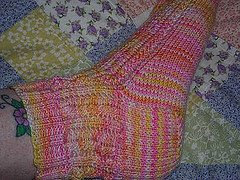 I used Claudia's Handpainted in "Jill's Pink" and a modified version of the Groovy pattern from sock pixie.